Yes I'd really like a full EEPROM backup/restore to/from SD on Taranis (and others). Find it more useful than single model backup/restore. The ARM processors can execute from RAM, so one way would be to have the loader code embedded in the flash as data, but copy it to RAM and execute it from there. The SAM-BA applets run in the RAM. Or the loader could be a file on the SD card, although this would need to be checked before running it! backup all the models to the SD Card? Would be possible to exchange models with a friend at the field..
MikeB wrote: I've got a bit of an idea, which should be possible, although certain practicalities my mean it takes a little while to get working. I'm not sure how useful these would be, but it could provide another method of updating the firmware, and wouldn't need SAM-BA installing. Either you upload the firmware file by plugging the radio in and using it as a disk drive, or you could also remove the SD card, copy the file to it and then replace the SD card. Sky9X V3 board you need to open the tx to remove SD card. so using as a Disk drive is better for that. the V2 board, some people made a slot on the Tx to be removable. The 9XR-por is the same way as V2 - need to cut a slot to be removable. Only Taranis has a ready built slot for SD. I think all 4 mentioned are good/needed. say you go to the field with a new version of FW, found there is glitches/bug during fly, you really don't feel comfortable keep flying with that minor glitch, you can reflash FW from the 'good' version FW stored on SD and still be able to fly. same for eeprom. Before you found out the glitches in FW, you already made some programing changes in some model and like to keep it, so you back up the eeprom to SD and later your can retrieve it when the 'bug-fixed' version of FW is available. each eeprom /FW on SD probably wants to have a way to identify which version they are associated. I will leave the issue what if there is a eeprom change between FW to you. I guess ideally is able to restore/backup individual model eeprom as well but I think the way the eeprom is structured with 9X FW. That is probably not possible without Sam-ba. If the ARM processor can handle that. exchange model with buddy on the field would be possible. With all that said, I just saw a 15" laptop for 200+ dollars -new at FRy's electronics. May be we should just bring a laptop to the field to do all this. Model exchange is already possible on openTx, individual models can be backed up/restored to/from SD card, the feature's been there for ages. But I'd really like a full backup too. The 9XR (PRO) has a little flap, under which is the connector for the programmer. On the PRO version, the SD card is also under the flap so IS accessible without opening the case. I'm part way towards being able to back up models to SD card, that and restore are planned. kaos wrote: ... May be we should just bring a laptop to the field to do all this. 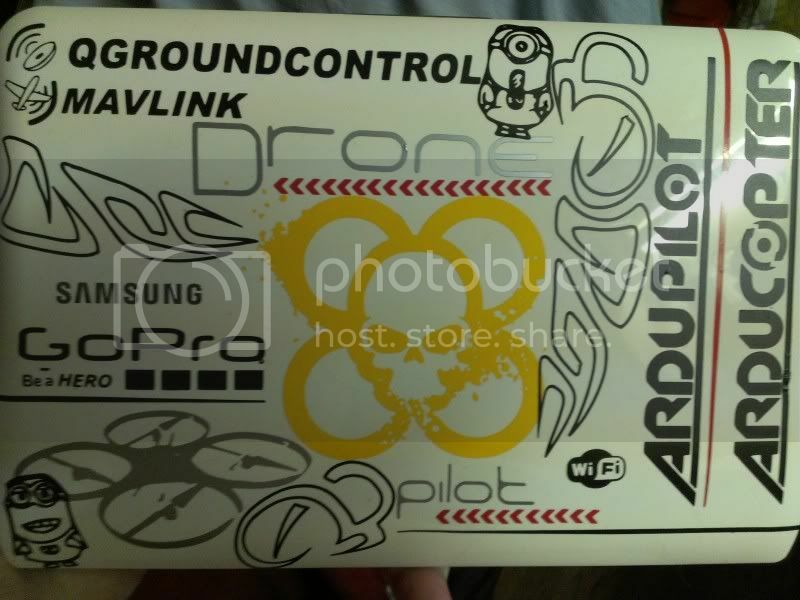 Ardupilot needs a notebook for sure. That is why I am using multiwii which I can set up via my cell phone app. I've also done some work on porting ersky9x to the Taranis. I'm doing this as a 'background' task, no timescale as to when it might be completed. I've just got the EEPROM added to my test program, so settings can be loaded and saved. Great stuff! Many thanks Mike. The simpleton asked "Hows about ErSky9X for Horus???". And the Genius from Dorset replied "Why not indeed? I shall get right onto it!" And then there was light on Horus! And it was good! Thanks Mike, Good news on ersky9x for Taranis, can't wait. error message. Only pressing the 'menu' key can I return to a menu screen, and on pressing 'Exit' to get out of that, the menustack overflow happens again. Basically, there is no way to exit out of any menu screen successfully once entered. Reverting back to R.186 and everything is back to normal. Don't know if anyone else has this problem. It sure does! Cheers Mike. All looking good again. Have also noticed the Telemetry logging spreadsheet on the SD card now from the previous updates. Will try that tomorrow. Earlier I flashed r187 found a bug. Before I could get my mits on the keyboard, adacadabra, presto, it's fixed. Great stuff. I am not sure what the optimum limit for sd card is, But I can report that I have had working in my 9x with rev3 board a 64Gb class 10 sd card. Right out of the box, I installed the voice file, (without formatting), insert the card AOK. All seem well so far. It's been working now for about a week. So far so good. If it's still OK at the weekend, I will try one in the revB board. MikeB wrote: OK, problem found, fix on its way! Have these problems been fixed? regarding vario level silence and sink tone option? I cant keep up, where do I download the R188 now? Hi, Try this link. Hope it helps. Last edited by RCHH on Tue Nov 26, 2013 10:41 am, edited 1 time in total. Odd, seems to be working OK on mine. I'll check I'm running the official r188. I flashed R.188 to the tx again this morning and had the same error. However, I re-downloaded a fresh copy, flashed it and all is working fine. I can only assume something was corrupt on my original. No need to look for any problem Mike. I was wondering what is the actual latest version firmware and co-possessor Verizon i should use? When i go to the download page, i read older versions then i can read here on the forum! And the actual download of the firmware you can't tell by the name which version you are downloading. Also the Wiki seems outdated with the link to the current version. Right click on "view raw file" and select "save as". And what about the special versions for FrSky i read on Wiki, should i use this as i am using FrSky? edit: asking for Rev 3 board. There is no 'speicial' version for ERSKY9X, only one version. In er9x/open9x there are different versions. The latest version can be downloaded automatically after you install the eepskye (use r391). open eeskye it will tell you what the latest version and if you want to download it. The latest Tiny app shold be 06. Once your tx is up and running you can check if you have 06.
kaos wrote: There is no 'speicial' version for ERSKY9X, only one version. In er9x/open9x there are different versions. Thank you for pointing me to it. Is there a link with a explanation how to use it (tred the forum search, no goodluck)? Also it doesn't seems want to connect, using same setting as on the SAM-BA. Where can i download the latest version of Tinyapp, as now my radio is asking tp upgrade the co-processor firmware. This can be made much more user friendly... (the menu's at Google). Finnaly upgraded to R188 + 0106. Unfortunately, that also needs time to do (the user friendly bit), and I'm a bit short of time to do everything! The latest TinyApp is from April 28 2013 (released as part of r166). Hi Guys, I've just returned from a short, (rather pleasant), stay in my penthouse suite at the local infirmary, (compliments of the (NHS). Nuff' said, as usual when I go away development has left me behind. So glad was I when I logged on to find Erskye R197, that I broke the cardinal rule (Try before you buy). In my eagerness I installed it without reading the pages of blurb about it. Mike I could not see the virtual drives on the TX. So I started to back track on the releases. Up to R182 all is good after that the drives are not visible.. Anoyher thing eepskye will not flash the firmware. The error message said drive not mounted. So i checked the box in eepskye, It starts the flash process then end with "sam-ba did not finish correctly". I had to use C9x to install. I still cannot see the virtual TX drived after R182. Any suggestions ?. Stan. The virtual drives are only available from the bootloader now. Once you have the bootloader installed (just by loading up R197 using SAM-BA), you shouldn't need SAM-BA anymore. I've read your posts about the work on the Taranis FW also Mike. Great job. As for the sky boards, good bye samba. Also, after a SAM-BA failure, look under the BURN menu for the "review output" option. This puts up the whole of the text from SAM-BA. You can copy this out and post it so I can see what happened. MikeB wrote: Also, after a SAM-BA failure, look under the BURN menu for the "review output" option. This puts up the whole of the text from SAM-BA. You can copy this out and post it so I can see what happened. OK Mike, Will do. Stan.